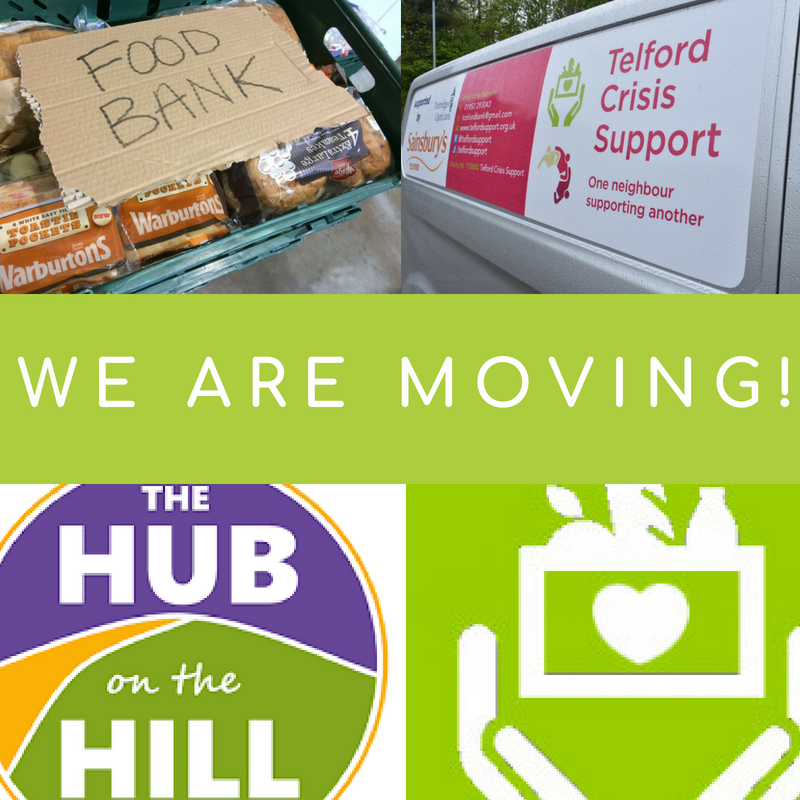 The Telford and Wrekin Community launches today with the first draw happening THIS Saturday 28th July! If you’ve not heard of this, Telford and Wrekin Community Lottery is an exciting weekly lottery that raises money for good causes in Telford and Wrekin. 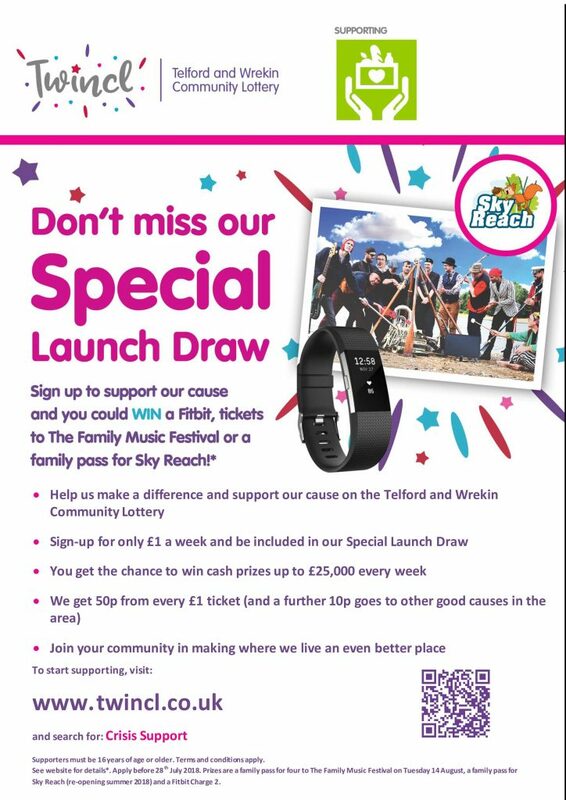 All good causes supported by the lottery will benefit Telford and Wrekin and its residents. 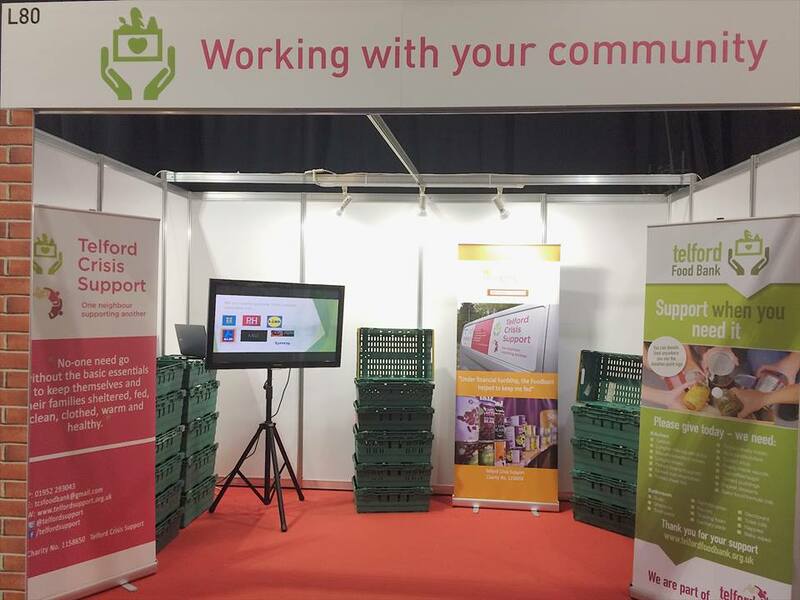 Play the lottery, support Telford and Wrekin – it’s that simple! From every £1 ticket sold 60p will go to good causes in Telford and Wrekin! To put this in perspective when you play the National Lottery 28% goes to good causes – This lottery has more than DOUBLED the ticket percentage that goes to good causes. You can choose which good cause gets 50p of the 60p (the remaining 10p will be distributed to other good causes). If you want to play along, please support Telford Crisis Support by clicking the link to purchase your tickets from our page here.. Author Admin1Posted on June 26, 2018 June 26, 2018 Leave a comment on Win up to £25000! Fridays don’t get Breader than this! We often get asked if we receive any support from local supermarkets, well the answer is yes! we get support and donations from Sainsburys, Morrisons give us donation points, and we collect end of day surplus from Marks and Spencer which is also being expanded to Lidl stores at the start of July! That being said, we weren’t quite ‘bready’ for what we received this afternoon! 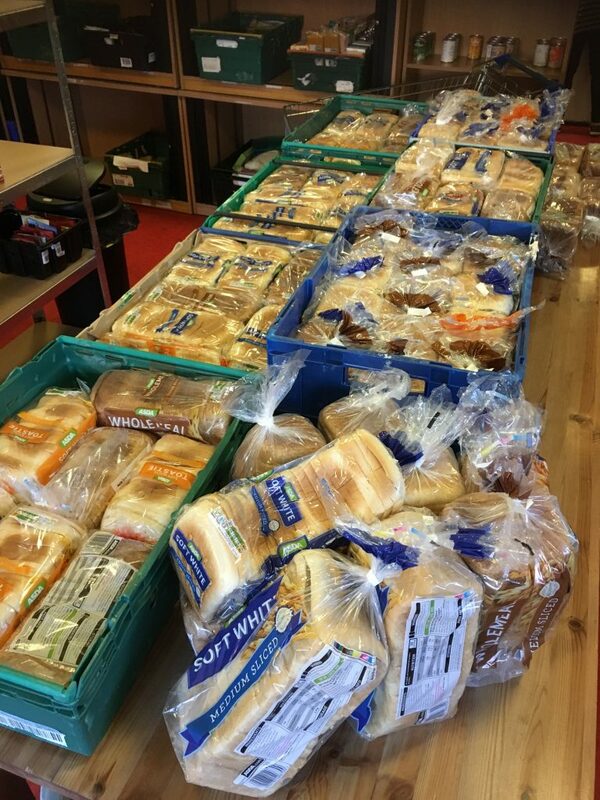 Thanks to June and other store colleagues at ASDA Donnington wood, they have all put in a £donation and bought us 100 loaves of bread!! They’ve really used their loaf on this one and we cannot wait to see what comes next! ASDA town centre will soon also be launching the donation tokens that will be handed out at the checkouts to be put in to one of three slots to support a charity, one of which will be Telford Crisis Support! Our donation trolley can also be found as pictured! Huge thank to everyone that continues to make a donation to the Foodbank! YOU are the heroes. Author Admin1Posted on June 22, 2018 June 22, 2018 Leave a comment on Fridays don’t get Breader than this! If you are a Telford or Central Shropshire based business or charity and would like sponsor us or provide ongoing support, please look at our new corporate fundraising page for some interesting ideas on you how you may be able to support our cause! Author Admin1Posted on June 11, 2018 Leave a comment on World Cup 2018 game! We’re always adding to our public and corporate wishlist. As we are moving into our new offices in July, We’d like a local company to support us by providing us with a Printer/copier for our office. We’re growing rapidly as a charity and we need to update our equipment. Author Admin1Posted on June 5, 2018 Leave a comment on Can you help? 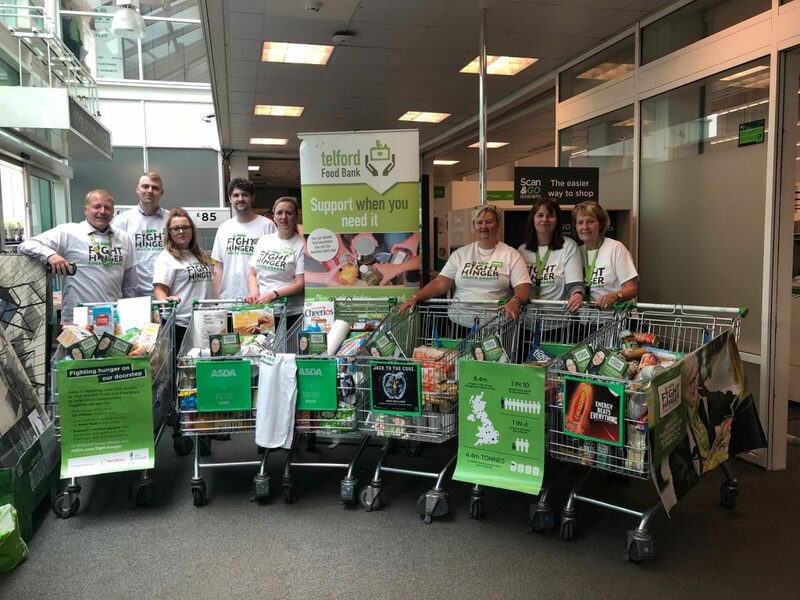 Saturday 2nd June was our first food drive hosted at the Asda store in Donnington Wood in Telford. 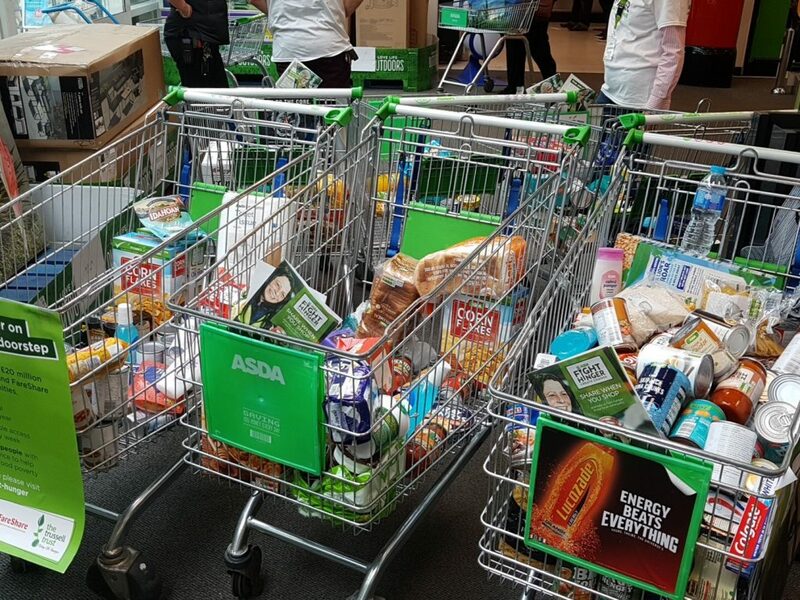 Thanks to a fantastic team of volunteers, store colleagues and generous donations from store customers, 10 trolleys were filled in just four hours! The donations are currently being processed and we have weighed in a total of 519kg of food!! Thank you to everyone that has made a contribution and thank you to Asda for helping us to help those in need. Our opening hours for donations will be between 10am and 5pm and our opening hours for referrals will remain between 12 and 4 Monday to Friday. 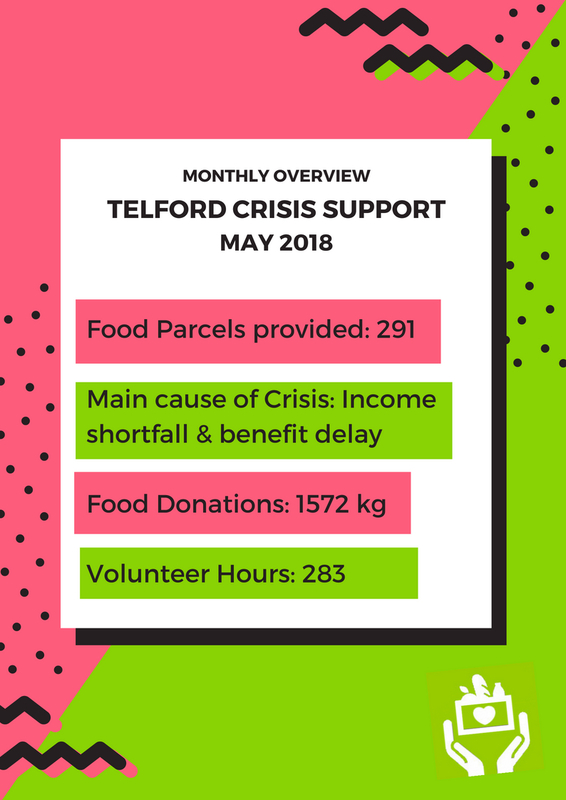 If you live or work in the TF7 area and you feel like you may be able to support Telford Crisis Support then please don’t hesitate to get in touch! We are hoping to increase our donation points in the TF1 and TF2 areas so again if you can help in any way please let us know! Author Admin1Posted on May 30, 2018 May 30, 2018 Leave a comment on NEWS! 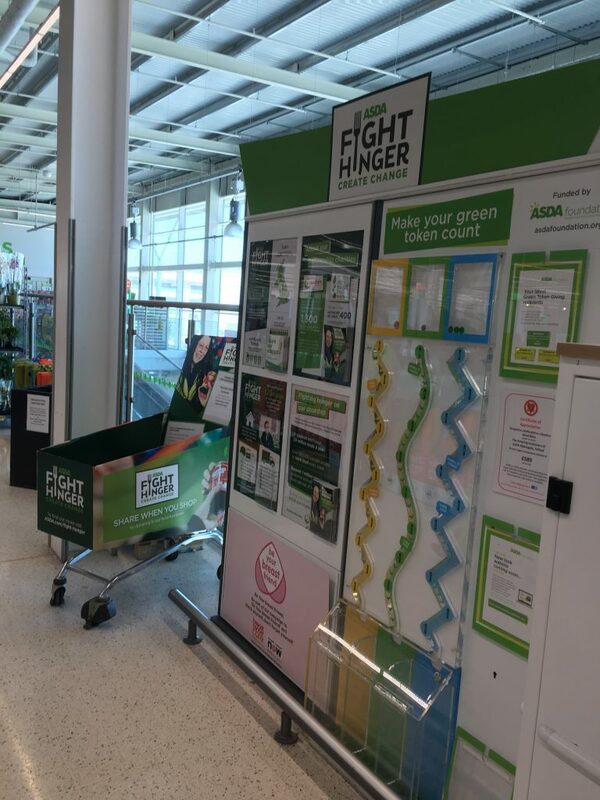 We have a brand new donation point at ASDA Telford town centre! 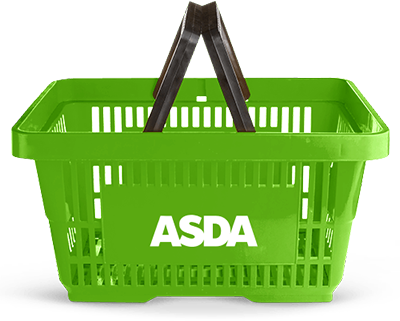 This is a part of the fight hunger, create change campaign in which ASDA aim to help to tackle food poverty in the UK. 8.4 million in the UK are struggling to afford to eat, 1 in 10 are missing meals to pay bills and 1 in 4 of those affected are children. The donation box is located just before the security desk as you approach the escalators. 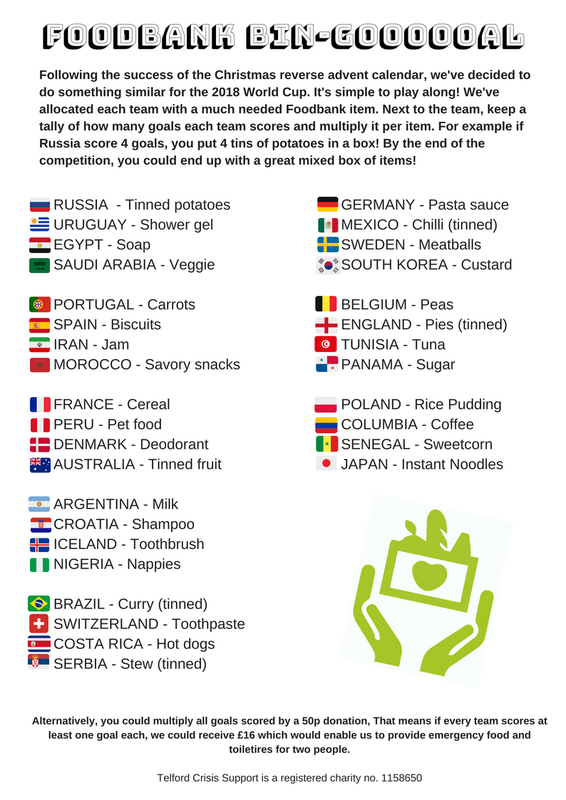 We also have a food drive planned at the Donnington Wood store on the 2nd June which is THIS Saturday! Author Admin1Posted on May 29, 2018 Leave a comment on New donation point! 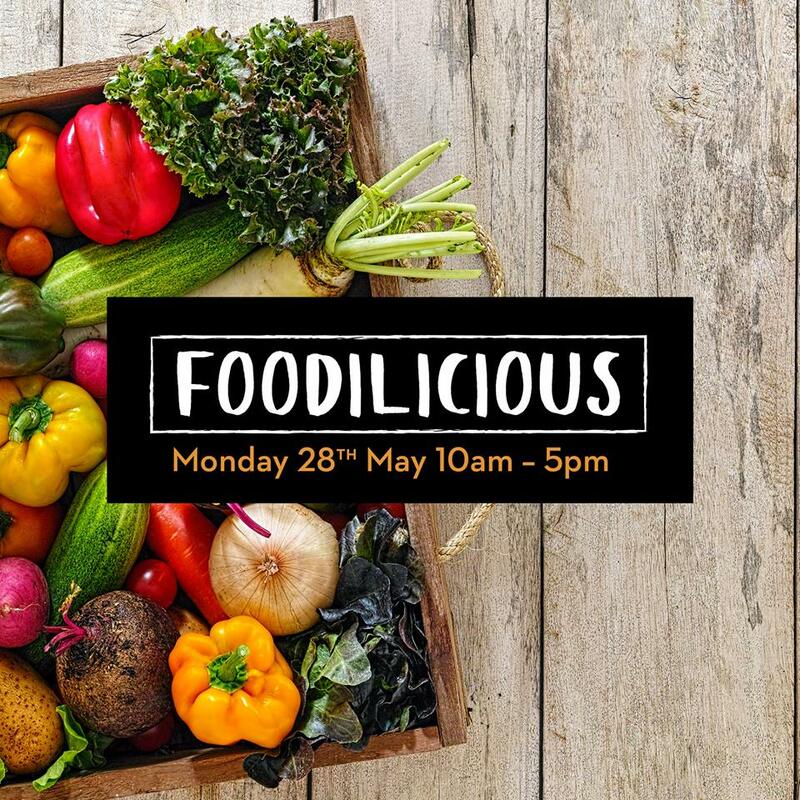 We are pleased to announce that we have been chosen as the supported cause for Telford Shopping centre’s Foodilicious event, please come and say hello to our team and see what’s on offer!